This CellML model runs in both OpenCell and COR to recreate the published results (figure 2). Where parameters were not defined in the paper they were taken from Lemaire et al. 2004. A force of 10N was applied at day 100 and removed at day 130. ABSTRACT: Bone is a dynamic living tissue that undergoes continuous adaptation of its mass and structure in response to mechanical and biological environment demands. 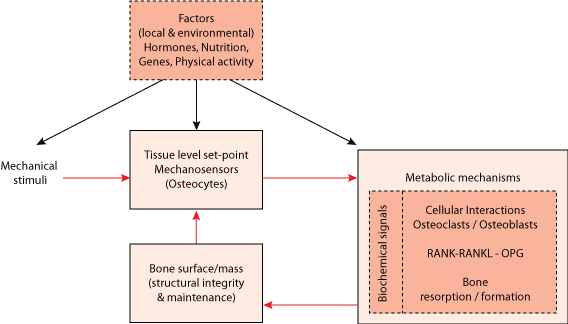 Studies of bone adaptation have focused on metabolic or mechanical stimulus, but mathematical models of bone adaptation considering both, are not available by now. In this paper, we propose a mathematical model of bone adaptation during a remodeling cycle due to mechanical stimulus with the introduction of osteocytes as mechanotransducers. 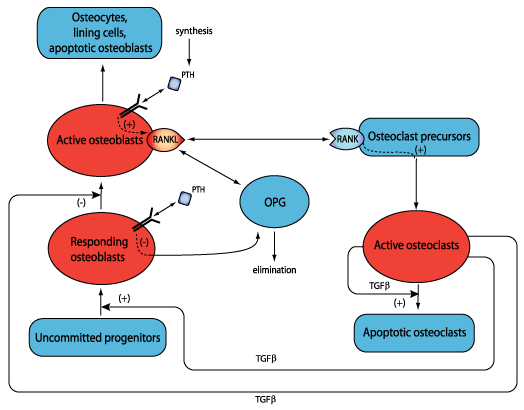 The model captures qualitatively very well the bone adaptation and cell interactions during the bone remodeling. Schematic representation of the basic structure of the model. Schematic diagram of the Lemaire et al. 2004 model of which the current model is an extension. Derived from workspace Maldonado, Borchers, Findeisen and Allgower, 2006 at changeset d1c385b5e9d2.